Colson Whitehead. Sag Harbor. New York: Doubleday, 2009. Pp. 273. ISBN: 0385527659. $24.95. Colson Whitehead is rapidly emerging as one of the major literary voices of the new millennium. Like Philip Roth a generation earlier, Whitehead writes elegantly and eloquently about what it feels like to be an upwardly mobile outsider in pursuit of the American dream. Already a recipient of a MacArthur Fellowship and a Pulitzer Prize nomination, Whitehead’s first two acclaimed novels, The Intuitionist (1998) and John Henry Days (2001), though very different in tone and topic, are both about high-achieving African Americans taking on the stereotypical status quo, surpassing the white man at his own game and eventually paying a high price for that success. His third book, The Colossus of New York (2004) shows a completely different side of this gifted writer. Alternately sweet, sassy and sardonic, it is an impressionistic cityscape that celebrates the people, places and vibes that make New York City one helluva town. 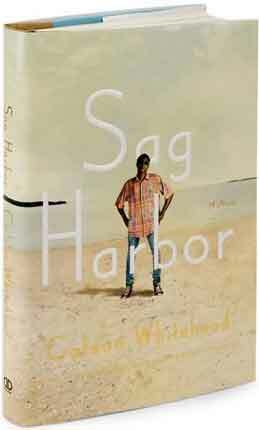 Sag Harbor blends all of Whitehead’s thematic ingredients and adds a dollop of pop culture references (he was a T.V. columnist and music critic for the Village Voice) to create a tasty literary gumbo: familiar yet exotic, alternately tender, touching and laugh-out-loud funny. Not completely comfortable in the white prep school milieu or the black street scene, for ten months of the year Benji and Reggie were at ease only with each other. Then came their summer in Sag Harbor, two carefree months in their parents’ ranch bungalow, filled with schemes, adventures and, best of all, camaraderie with other well-off black kids just like them. “We fit in there,” Benji declares. Autobiographical or not, Whitehead captures the angst, eagerness and apprehension of adolescence burgeoning into adulthood pitch perfectly as Benji lands his first job, has his awkward first date, and struggles to be accepted by the cool kids. But what separates Sag Harbor from other coming-of-age in the summer stories like Good Bye Columbus, Brighton Beach Memoirs and Summer of ’42 is its nuanced depiction of race and place. By the mid 1800’s the area had a small but vibrant African American community whose Zion African Methodist Episcopal Church was a station for the Underground Railroad. But the person responsible for the development of Sag Harbor as a summer playground for affluent black families was Maude Terry, a visionary schoolteacher from Brooklyn. Colson’s fluid prose seamlessly integrates the genesis of the African American communities of Sag Harbor into the novel. Here’s Benji ruminating on his way to the ice cream shop where he works. One day our Maude, after walking through the dirt paths summer after summer to what would become Azurest Beach, decided to investigate who actually owned those woods … The twenty acres belongs to a man named Mr. Gale, who’d been trying to unload them for some time … Terry hatched a plan where she’d sell the lots for him—to her friends, to her friends’ friends, and so on, the middle-class black folk of their acquaintance. The word went out. One by one the houses went up. And it is from these houses that Colson Whitehead takes us on a guided tour through the streets, shops, beaches, and hideaways of this sun swept African American enclave as seen through the eyes of an awkward adolescent searching longingly for manhood.